IN THE NEWS July 21, 1972 - COOL & SMOOTH AS GIN & TONIC is an apt description of Perry Como's vocal style as he captures audiences at the Las Vegas Hilton. The Union Plaza is still partying for it's "Lucky One" birthday as you can see from the view of its pool that overlooks downtown. Amazingly enough, the photo of Wayne Newton (what a baby!) announces his new maturity, confidence and "presence" with his latest show at the Frontier's Music Hall. 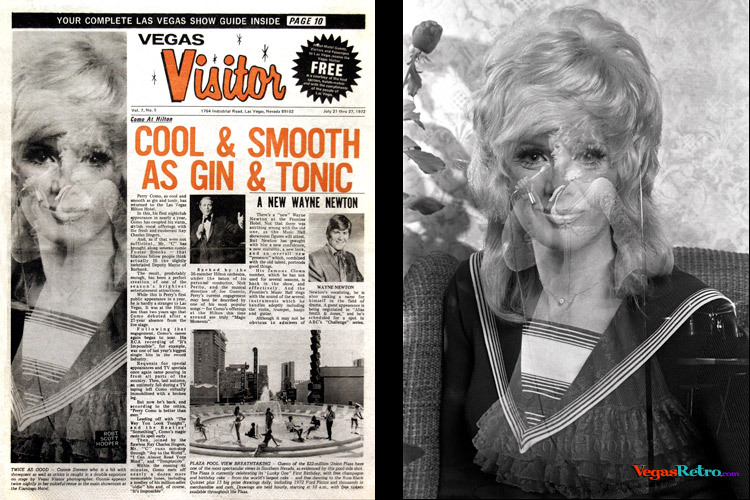 Cover Girl Caption TWICE AS GOOD - Connie Stevens who is a hit with showgoers as well as critics is caught in a double exposure on stage by Vegas Visitor photographer. Connie appears twice nightly in her colorful revue in the main showroom at the Flamingo Hotel.